I love Fuji's XF 100-400mm zoom. Not only is it tack sharp at every aperture, when combined with the X-Pro2 it is an incredible tool for high resolution tight shots of subjects. Amazingly, it has the added convenience of being able to be used hand-held. This is a combo, along with the 1.4x teleconverter, that I find myself using more and more. 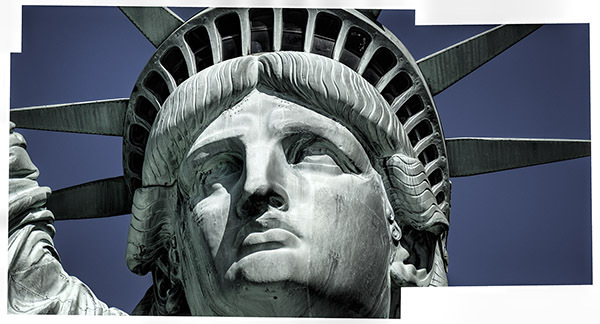 For this image of the Statue of Liberty I stitched three photos together. Each was shot at 560mm, a full frame equivalency of 840mm, and that was hand-held. I later added contrast while also muting and desaturating the colors to give the images a more rugged tone. I intentionally left the over-lapping borders of the three original photos to involve the viewer in the stitching process. The result is a very high resolution image suitable for an extremely large print size.